The SNES Classic Edition is technically loaded with 21 games, but when you unfold Kirby Super Star, you find something a little extra: Eight games in one. Hey, we're talking about a Kirby game, here. That little pink puffball can probably hold entire galaxies in his belly. It's only natural one of his games makes like a Russian nesting doll, too. The SNES Classic's game count "cheat" is totally our gain. Kirby Super Star was one of Nintendo's final games for the SNES, and it neatly caps a strong legacy of A+ platformers for the 16-bit system. I'm not as zealous about Super Star as I am about Mega Man X, Super Metroid, or Yoshi's Island, but neither does it feel wrong to have Kirby bring up the rear on the SNES Classic's line-up (and on this review series. Sniff). Spring Breeze - A remake of Kirby's Dream Land, Kirby's debut adventure on the Game Boy. Spring Breeze is a little trimmed down from Dream Land, however: A couple of levels are merged, and some boss fights are cut. Dyna Blade - In this miniature adventure, Kirby takes on the titular Dyna Blade, a giant bird that's destroying Dream Land's crops. There are four areas to clear, in addition to a couple of secret areas. The Great Cave Offensive - A treasure-hunting / adventuring game. Kirby gathers up medals, gold, and even relics belonging to other Nintendo heroes (see if you can find Mr Saturn!). 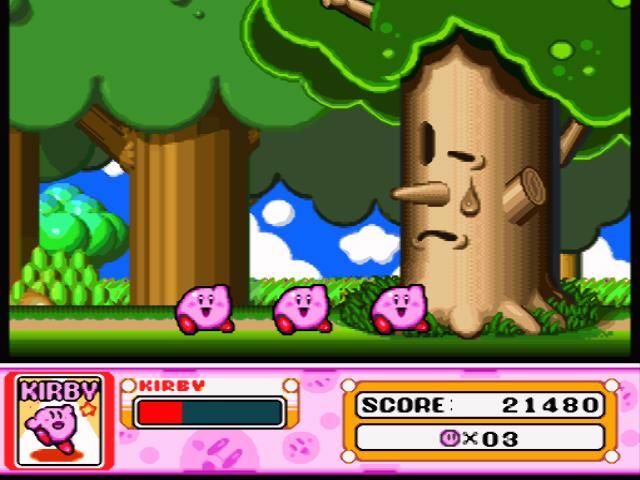 Kirby moves through narrow corridors packed with enemies in this game. You might be surprised at how easy it is to get creamed in this one. Gourmet Race - Kirby and King Dedede run a race while stuffing their gobs full of food. This humble mini-game is the birthplace of the greatest Kirby tune of all time. Revenge of Meta-Knight - Another miniature Kirby adventure. Meta-Knight decides he has a beef with the "laziness" of Dream Land's citizens, and he vows to do something about it. Kirby stops him by attacking Meta-Knight's battleship, the Halberd, piece-by-piece. That's right, Kirbs. Fight for our right to eat and nap all day. Milky Way Wishes - Milky Way Wishes is the longest game included in Kirby Super Star. When the sun and the moon start fighting with each other, Kirby goes on a journey across seven planets to ask the comet NOVA for help. Probably better than just letting the sun and moon get tired of punching each other in the face. That's the kind of thing that shouldn't be allowed to go on for too long. The Arena - Kirby battles against a string of bosses, because he is a good strong boy. Samurai Kirby / Megaton Punch - Timing-based mini-games you can play against the CPU or another player. As you can probably tell, several of the games on Kirby Super Star are well beyond the realm of single-screen diversions. This isn't some rip-off mini-game collection. Put together, the content of Super Star equals any decent-sized SNES action-adventure title, and then some. The games all play well, too. After all, Kirby is Kirby. If Ys is the most dependable RPG franchise on the market, I vote Kirby as this industry's most dependable action franchise. Kirby also runs on a very different set of mechanics than Mario, Mega Man, et al. That alone makes them interesting. Kirby games are less about finesse (after all, bottomless pits are far less of a danger to Kirby than Mario) and more about careful exploration and learning how to use Kirby's enemies for your own gain. There isn't a lot of gameplay variation between most of the games in Kirby Super Star, but that's OK: Kirby games are a unique experience to begin with, so you probably won't get sick of binging on Super Star's collection of adventures. Do we have to keep harassing Whispy Woods? He's a tree. He doesn't move much. Super Star's "Helper" option is another Dyna Blade feather in the collection's cap. When Kirby inhales an enemy in one of Super Star's adventures, he can turn his foe into a CPU-controlled sidekick that uses its powers for good. Kirby can re-absorb his friend whenever you want – which is a little horrifying, but that's none of our business. Helpers can also be controlled by a second player, essentially making Super Star a meaty two-player experience. Kirby Super Star may not be a member of platforming royalty like some of the games included on the SNES Classic Edition, but it's fun, well-rounded, and very enjoyable to be around – like its puffy protagonist. Don't forget to give Kirby the attention he deserves when you get your own SNES Classic. 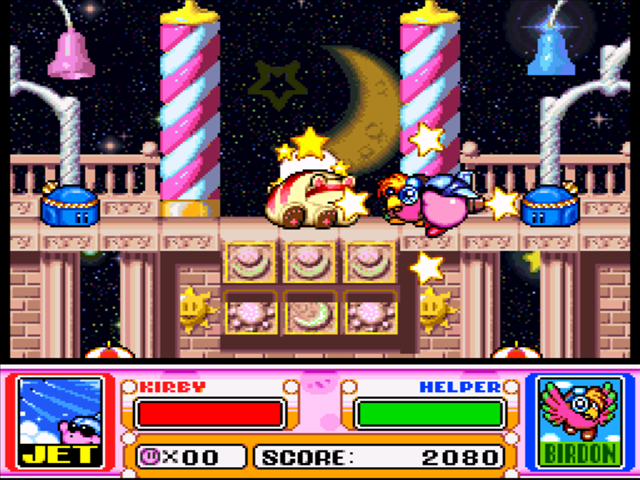 Don't mistake Kirby Super Star for a middling collection of single-screen mini-games. This lovely bundle is a buffet of adventures, each of which is quite filling on its own. It's almost cheating to consider it a single entry on the SNES Classic's menu, but who's complaining? Tagged with HAL Laboratory,	Kirby Super Star,	Nintendo,	Retro,	Retro Reviews,	Reviews,	SNES,	Super Nintendo Entertainment System: Classic Edition.